Personalized Zippered Folders -Portfolios Custom Printed in Bulk. Promotional, Inexpensive, with Padded Leather-Look Covers, Calculator and Electronic Device Holders. Budget Prices in America. 9-7/8" W x 13-1/8" H.
Bulk Zippered Folders - Portfolios with Leather Imitation Covers, custom printed with your logo. We also supply blank (not custom imprinted) bulk portfolios for $9.45 each. The executive style padfolio features, premium simulated leather, stitched padded cover with zipper closure and a curved exterior pocket. 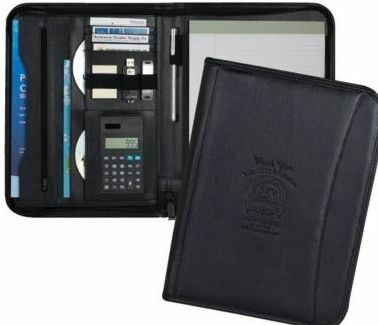 The interior organizer includes, pen slot, writing pad, expandable and zippered file pockets, business card holders, 3 electronic device (USB) holders, 2 pockets for CD storage, and a 8 digit dual powered calculator. This item can either be screen printed or blind debossed (up to 12 sq. inches for blind deboss). 10 1/4" W x 13 1/2" HFree artwork design. We will send you a proof for your approval before production. Budget Prices for USA, Canada for wholesale custom printed portfolios. American clients pay no taxes. Unit Prices below include your custom debossing or your 1-color custom imprint (silk-screen). Contact us for extra imprint colors or for blank zippered folders. Imprint Setup Charge: $40.00 per color; Debossing Setup Charge: $60.00. Imprint Area (WxH): 5" x 8" for silk-screen imprint; 12 sq. in. max. for debossing. Packaging: Individual Polybag; 20 units per carton of 37 lbs. Production Time: 5-7 days after art approval.